Once a year in the Protectorate, the youngest baby is sacrificed to a witch who lives in the woods. In return for the children, she leaves the Protectorate in peace. Or so the story goes. But the witch, Xan, who finds the abandoned children on the Day of Sacrifice each year doesn't understand why they are left there to die. She saves them and travels across the woods to the villages on the other side, where she knows they will find loving homes, feeding them starlight along the way. One year, she accidentally feeds the baby moonlight, enmagicking the girl, who she decides to raise as her own and call Luna. But as the years pass, Luna's powers become stronger, while Xan grows weak, and Luna's mother is looking for her. So is the true witch who has trapped the Protectorate in its own fear. I enjoyed watching various stories come together in this Newbery-Medal winner that focuses on the good people in a corrupt society harvesting an environment of despair and turmoil for its own power. It reminds me of the words television personality Fred Rogers said, to "look for the helpers." Of course, there is Xan, the gentle soul made out to be a demon as she rescues the children the society discards. Luna's mother, the madwoman, is also a particularly symbolic and empathetic character having lost her child to the Protectorate that then imprisoned her for her resulting madness. Yet somehow, she has the strength and knowledge in her heart that keeps her from giving up on her daughter. Another of my favorite characters is Antain, a young man with many questions and the courage and willingness to seek change. His and the madwoman's entwining stories are moving and interesting to follow. Antain's wife also has the strength of character, purity of heart, faith, and courage to outweigh fear, especially after her own child is born, the youngest in the Protectorate at the time of sacrifice. 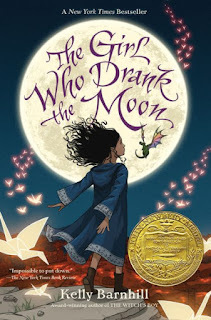 The Girl Who Drank the Moon is a beautiful reflection on the difference between the stories we hear about people and who they really are, and demonstrates how true strength can overcome the power of fear. What stories remind you to take a deeper look at people or inspire you to remember courage in the face of darkness? Ooh, this story sounds so fascinating! I love that the witch they think they're sacrificing to ends up saving the poor babies every year, such a thought-provoking twist. Thanks for a great review, Laura!